I had the darndest time setting this up. Between the ORk custom controls guide and the one the Explosive wrote for this asset I was have a really hard time setting this up to work. I kept running into issues of either the camera not being controllable or the player getting caught in a teleport loop (I still have no idea what was going on there). Took me 4hours to figure this out. So I'm going to write up a guide for this specific camera asset for ORK. And save everyone else the effort. I know a few people touched on it previously, and even GIL wrote his own guide, but I feel there needs to a full tutorial from start to fin on how to setup one up. So here it is! A practical 0 100% guide for custom camera guide for this asset! 3: Pull up your player prefab the one your combatant will use. Lets go with Gils example of Brown Pants. We need to make a New Tag for the Camera to target. Check the inspector Window -> Tag -> Add Tag -> Click the + Sign and name it "Brown Pants"
That's it for Prefab settings. Into the Framework we go! It is that simple. You'll be up and running in 5 minutes or less. Last part though. 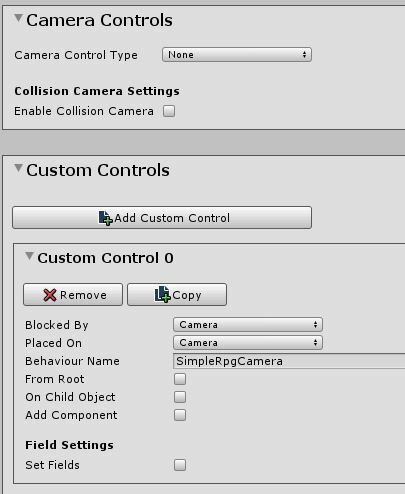 In every scene you make now you need to replace the default Main Camera with your prefab. So when you zone it will instantly use the new camera instead. For comfort purposes I would recommend changing Target -> Target Offset Y to 1.25 This will keep your camera out of the ground, also change the Zoom -> Auto Zoom Speed from 1 and 10 to 3 and 8. I would also change the Zoom range from 1 to 10 to 3 and 30 and fine tune from there to your custom needs. Its quite comfortable for me there. Its fast but not too zippy and very smooth, it really feels pro to me.